These Thin Line Flag Luggage Tags will let you show support for your local Professionals. They can also serve as memorial for family or friends that have been lost serving their community. 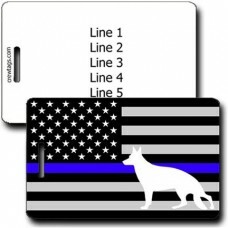 This black and white flag with the thin blue line will show your support for your local K-9 Police, .. This black and white flag with the thin blue line will show your support for your local Police, or a.. 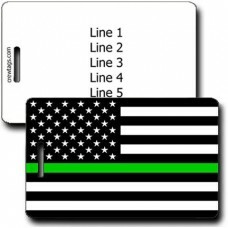 This black and white flag with the thin green line will show your support for your local Border Patr.. This black and white flag with the thin orange line will show your support for your local Search and.. This black and white flag with the thin red line will show your support for your local Fire Fighter,.. This black and white flag with the thin silver line will show your support for your local Correction.. This black and white flag with the white line will show your support for your local EMS, or as ..